Large top opening siphon sandblasting cabinet gives you easy access to the blasting area. Constructed of 18 gauge steel. 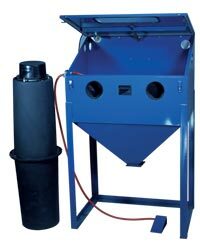 Includes gloves, blast gun, HEAVY DUTY dust collector, and grit trap. Accepts glass panels as large as 33�W x 20�H. Abrasive grit not included 59�H x 37�W x 25�D Window size: 18�W x 7�H Air Supply:14 CFM @ 90-100PSI. This Item Cannot Be Shipped via Express Delivery. This item is shipped by truck F.O.B. Michigan. Shipping weight is 175 lbs. You pay freight charges upon delivery to the freight company.